Do not store chemicals alphabetically or grouped by size. Chemicals can be incompatible, and therefore create hazardous situations. Be sure to do thorough research on each chemical, prior to handling or storage. Chemical Storage codes are grouped by color and hazard – providing a safe and easy way to classify your chemicals. Red – Flammables. Segregate in a flammable or fire proof locker. Blue – Health hazard. Inhalation, ingestion or skin absorption is toxic. Wear protective equipment before handling or storing. 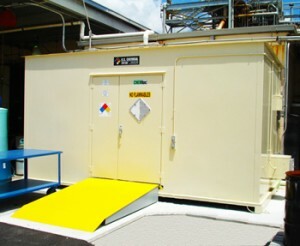 Store in a compliant chemical storage building. Yellow – Reactive / Oxidizing reagent that can react violently with water, air and/or other substances. Separate from other chemicals – flammables, combustibles or non-flammables. White – Corrosive. Harmful to skin, eyes and mucous membranes. Segregate from any other chemicals. Is volatile and can react. Green – Slight Hazard – General chemical storage, CHEMLoc building for compliance. Gray – Moderate hazard. Store compliantly in a completely sealed chemical storage building. Stripes (“STOP”) – Incompatible with other chemicals, reagents, corrosives, or flammables. Separate from other chemicals. U.S. Chemical Storage illustrates chemical storage codes and proper chemical storage techniques for flammables. Optimally, incompatible materials such as flammables, corrosives, acids, alkalis, reagents and other chemicals should be stored separately from other chemicals. Separate chemicals with a partition wall (solid) or a separate chemical storage locker. Do not store chemicals in laboratory hoods, this can harm the fume hood. Therefore, making the fume hood non-compliant. Cooling Systems (refrigerated, or freezer storage): Some flammables and corrosives require refrigerated or freezer storage in order to remain stable. Ordinary household refrigerators are deemed inappropriate for storage of flammable liquids because of electrical hazards. Proper explosion proof refrigerators and freezers, as well as air condition systems, are considered appropriate for chemical storage situations. Since refrigerators and freezers have no interior space for venting, flammables, corrosives and other chemicals should have tightly sealed lids. When storing hazardous substances, make sure chemical storage codes are labeled on the chemical’s container or bag. Post hazard information where the general public can see, on the door and on the side(s) of the building. Visit US Chemical Storage to learn how to make your chemical storage fully compliant and maintained. Chemical storage specialist with a concentration in federal, state, and local regulations that address flammable chemicals and hazardous material management. Leave a Comment, Question, or Quote Request Click here to cancel reply. © 2018 U.S. Chemical Storage. All Rights Reserved.